Benalmadena is considered to be quite an upmarket seaside resort and is located on the Costa del Sol in Spain. The resort is family friendly and along with neighbouring Torremolinos and has one of the most lively nightlife scenes on the entire Costa del Sol. Benalmadena is at its busiest in the summer months because of its beaches, golf courses and theme parks. Golf courses to spend a day at include Benalmadena Golf and the Parador de Malaga Golf which is located to the north of the resort. This is a fabulous holiday destination for families with children not only because of the golden sandy beaches but because of its theme parks. Selwo Marina Sea Life and Tivoli World provide great days out for the whole family. 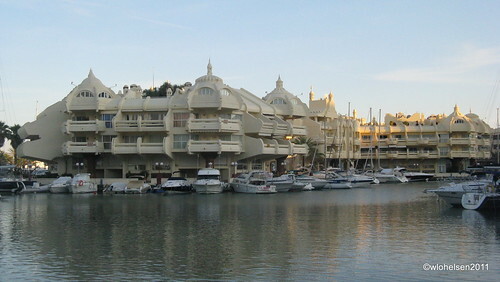 Benalmadena has a little more than nine kilometres of beaches and an award winning marina. You can see the main beach on this web cam page. Benalmadena beaches worth visiting includes Torre Bermeja Beach, Playa Santa Ana Beach, Arroyo de la Miel Beach, Torrevijia Beach, Las Yucas Beach, Las Viborillas Beach, Arroyo Hondo Beach, Torremuele Beach, La Perla Beach, La Morera Beach, Tajo de la Soga Beach and Caravajal Beach. Benalmadena has two airports in its vicinity which are Gibraltar Airport to the south and Malaga Airport to the north. Malaga Airport is the nearest of the two and is only sixteen kilometres away with a driving time of just under twenty minutes. Gibraltar Airport is eighty-five kilometres away roughly an hour by car. Benalmadena along with the tourist resorts of Marbella, Torremolinos, Puerto Banus and Fuengirola are fairly well developed as is their transport infrastructure and here the holidaymaker has more choice than ever of how to get to their accommodation and what they can do while on vacation. From Malaga International Airport there is the choice of train, bus, direct transfer, taxi and car hire to get to Benalmadena while from Gibraltar Airport transport options remain more along the lines of taxis, hire cars and a vastly reduced shuttle service. Train services run both ways every twenty minutes from five in the morning until midnight with a travel time of eighteen minutes at a cost of €1.65. Bus services cost as little as €1.40 for a single ticket and run from seven in the morning until eight at night, and from Benalmadena to the airport from eight in the morning until ten in the evening, with a travel time of an hour. A taxi fare from Malaga Airport will cost about €30 while from Gibraltar Airport given the longer distance costs about €128. Shuttle services from Malaga Airport to Benalmadena can be booked with companies such as Resort Hoppa from as little as £60 for a return for a family of four while from Gibraltar Airport to Benalmadena there are very few shuttle service providers and the best I could find was with http://www.holidaytaxis.com from £67. A tip for people who wish to save money by travelling by bus from Gibraltar to Benalmadena is to cross the Spanish border and from the Linea de la Concepcion bus station catch a bus to Benalmadena. With a travel time of two and a half hours and a cost of €9.83 for a single fare there are three daily services. To keep up to date with bus services to Gibraltar you can look at http://www.benalmadena-arroyo.com. Having covered all the transport options from both Malaga Airport and Gibraltar Airports apart from car hire, we can look at how to hire a car from either airport. At Gibraltar Airport you can hire a car with either Niza or Avis cars. Cars can be rented by the week as well as by the day meaning that your holiday time can be flexible. There is a filling station for unleaded or diesel a kilometre away from Gibraltar Airport. Malaga Airport is quite a large airport with many more car rental providers which includes Auriga Crown, Autos Lido, Avis, Europcar, Goldcar Rental, Hertz, National Atesa, Record, Sixt and Sol-Mar. Depending on whether you have booked a car needing to be refuelled before you even get going, there is a petrol station at the entrance to Malaga Airport. Petrol is an important issue when it comes to car hire because if you have booked a car with a full tank you will have to return it that way, or if its is empty you will need to put some petrol in to ensure arrival at your destination. If you fail to refuel a car that came with a full tank of fuel you will be faced with not only the charge to refill it but a hefty surcharge as well. As different car rental companies have differing criteria and policies it is always wise to bring the correct paper work, and even choose car hire on the basis of petrol, boot space, gps and car seats. First question you will need to ask yourself regarding car hire is: am I eligible to book car hire? People over the age of twenty-five qualify to rent a car and in some cases you do need to be at least twenty-one years of age to be eligible to hire a car and be in possession of a valid drivers’ license which you must present to the agent on arrival at the airport. Is there anything else that the car rental agent might ask to see, such as my insurance papers? You do not need to present your U.K. insurance papers on arrival but show them your passport as well as the credit card with which you made the car rental booking. Can I put a named driver on the rental agreement? Most car rental companies will allow you to put a named driver on the car rental contract completely free of charge. They will just need to present their passports and drivers license at the same time as you present your documentation. It is always a good idea to carefully look at your car on collection to make sure there is no minor damage which you could be liable for and if you notice any imperfections, point these out to the car rental agent on duty. Are there any cancellation fees? Should you need to cancel your holiday, you will be able to cancel your car rental as well and should you find cheaper car rental else where ask the provider to match the quote or you are perfectly entitled to cancel the car hire and rebook elsewhere. Is petrol included in the car hire? That varies from company to company. It is up to the individual to decide if they would prefer to sort out the petrol themselves. It is best always to return the car in the same condition it came in. What insurances are included in the price of the car rental? You will be fully covered in case of an accident apart from any medical expenses which you may incur. These should be covered by your travel insurer. What is not covered by the insurance are usually smaller items such as tyres, windows and keys which for a small fee can be added to your insurance. What happens if I am late returning the car? It is best to book the car for as long as you will need it because although a little tardiness is okay if it is more than two hours you are likely to be charged for an extra day. Will I automatically receive unlimited mileage? All car hire companies guarantee free mileage which allows holidaymakers to make the most of their vacations as opposed to just getting to their villas and back to the airport again or being charged by the kilometre. If you are unlucky enough to be caught speeding or receive a parking fine, it is best to find the local town hall and pay the fine personally as soon as possible or at least inform the agent at the time of the vehicle drop off. If dealt with in an honest manner a further fine is very unlikely otherwise you may find that in due course a large amount of money booked off your credit card. What happens if I break down in Benalmadena? Included in the price of your car rental is a 24 hour break down assistance which will give everyone peace of mind especially if you are not fluent in the Spanish language. Can I rent a car seat for my baby or young child? Yes you can rent a car seat for your baby from as little as €3 a day. These should be booked at the same time as booking your car rental to avoid disappointment and having to purchase one in Spain. Do all cars come with a built in GPS? A GPS only comes as standard in the high end models available to rent by the week. A GPS can be rented on arrival from €5 a day or for about £30 a week. Optional extras you may be interested in are items such as snow chains and ski racks for winter sport outings in the Sierra Nevada or roof boxes and roof racks for extra storage. The most important things to remember when booking your car hire are the arrival times of your flight regards the fuel situation and adequate boot space for all of your luggage. How Much Does Car Hire Cost? You can rent a car from Gibraltar Airport from as little as £180 in a Ford Ka for a two week period during the month of September. Car rental rates are seasonal so the same car will be cheaper in October and November. A family sized car such as a Seat Ibiza Estate will cost £321 for two weeks in the same period, while a people carrier such as a Renault Traffic will cost £940. Car rentals from Malaga Airport can really cheap because there are so many agents and services to compare. During the same period of time you can hire a car from as little as €217 in a model such as a Smart For Two, €264 for a Renault Megane and €525 for a people carrier such as an Opel Zafira. Given the cheap alternatives of getting to Benalmadena from Malaga Airport, car rental is more of a luxury than a necessity but if you want to explore inland and visit places such as Ronda, Mijas or even Granada then you can choose to hire a car locally for a day or two. For so many different reasons it seems much better to fly into Malaga Airport especially given the short transfer time, choice of carriers, transport options and cheaper car hire. Be very careful if using Brians Rent A Car advertised on this site. We had a terrible time claiming back a withheld deposit. Check them out on trip advisor and the Olive press. We don’t advertise them, they are merely listed as one of the local suppliers for car hire. I’m sure every company has some negative feedback but if excessive, we shall definitely be removing all mention of them from our website.